The Wallabies believe their remarkable defensive performance against Wales could be a pivotal moment in their bid for a third Rugby World Cup triumph. A week after unleashing their attack in a free-flowing win over England, Australia turned the screws and showed the world it has the defence to win big games with a gritty 15-6 win over Wales on Sunday morning (AEDT). 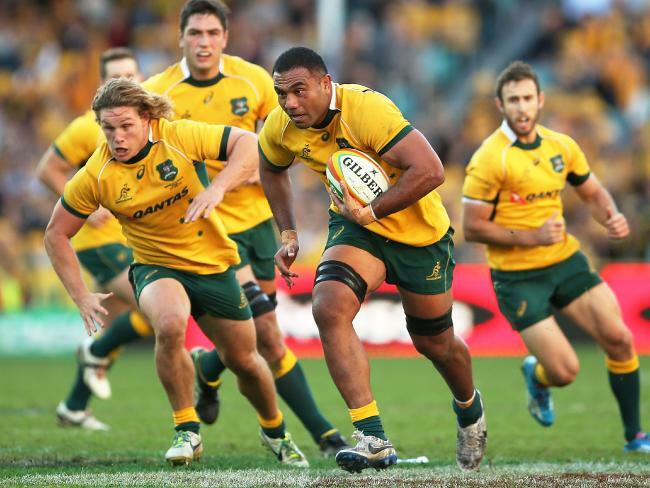 Tries were not on the menu for Michael Cheika's men - only guts and determination. And it is hoped the defensive masterclass, which included protecting their line for nearly 10 minutes with two players in the sin bin, will come to define their tournament. "We're proud of ourselves and proud to be Australians but we've got Scotland next," veteran winger Adam Ashley-Cooper said. "But if we were to go all the way, then that period (in defence) could certainly be seen as a pivotal moment. "But that's what this squad has been doing, day-to-day. "We're just keeping our feet on the ground and not getting ahead of ourselves." When the Wallabies were criticised for not chasing a bonus point in their opening clash with Fiji, Cheika remained unfazed. His only goal was to stay undefeated. "A World Cup isn't about tries, it's about winning," said back-rower Scott Fardy. "We didn't get a bonus point against Fiji and everyone was carrying on a bit. "But we knew that this tournament was about winning games, that's what we're interested in. "Whether it's tries or goals, I don't really care. I just want to win. And that's the mentality of the team. "Obviously we want to play our brand of rugby, but sometimes things happen and we can't do that. "When that happens, we'll muscle one out and that's what we did (against Wales) which was great." Fellow forward Kane Douglas hoped the dogged goal-line defence would stick with them for the remainder of the World Cup. With the toughest matches still to come, the lock wants to be able to look back at Sunday's effort and be able to draw from it. "Hopefully as far as we go along in the competition, we can look back and go 'that is a great passage' because it was, it definitely was," he said. "There's a lot of positives to take out there, but there's still a lot of improvement in the next three weeks."